Chef and cookbook author (and our friend) Del Sroufe created this dairy-free yet delectable fall dessert for our new book, The Forks Over Knives Plan: A 4-Week Meal-by-Meal Makeover. 2. To prepare the filling, combine the apples, sugar, cinnamon, and nutmeg and toss until well coated. Transfer the apples to a large saucepan or Dutch oven. Cook over low heat until the apples start to release their juices, about 5 minutes. Sprinkle the flour over the apple mixture and cook until the filling thickens, about 5 minutes. Transfer the mixture to an 8 x 8-inch baking dish and set aside. 3. To prepare the topping, in a medium bowl, whisk together the oats, flour, sugar, and cinnamon. Add the applesauce and stir to blend. Scatter the mixture over the apples in the baking dish. 4. Cover the dish with foil and bake for 40 minutes. Remove the foil and bake until the filling starts to bubble, about 15 minutes more. Serve hot or warm. The trailblazing film Forks Over Knives helped spark a medical and nutritional revolution by making the case that modern diseases can be prevented and often reversed by leaving meat, dairy, and highly refined foods off the plate, and adopting a whole-food, plant-based diet instead. 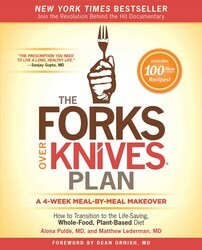 Now, for the first time, The Forks Over Knives Plan shows you how to put this life-saving (and delicious) diet into practice in your own life. Dig into the tasty recipes for Chocolate Raspberry Parfaits, Lemon-Oatmeal Cookies and other goodies. Alona Pulde, MD, is a family practitioner specializing in nutrition and lifestyle medicine. Alona developed the Lifestyle Change Program used for patients in the film Forks Over Knives and in her clinic, Transition To Health. She is the author of the book Keep It Simple, Keep It Whole: Your Guide to Optimum Health. Alona joined Whole Foods Market in 2010 as a health and wellness medical expert.